Vintage Mens 1990s shirts included Stripes, florals, Hawaiian blues and sloganed tees, these were the shirts of the 90s, that and a grungy dedication to looking messy and appealing all at the same time with a baggy plaid shirt. If you want to recreate grunge and add some contemporary constraints on it, then why not bag yourself an authentic vintage 1990s shirt and make the look as dynamic as you can? With our collection of 1990s shirts you can make a difference to what you wear by incorporating something that can look utterly modern in an instant or traditionally 1990s if that’s how you like it. If you want florals then have them, they’re so on trend right now and you’ll have a garment that will stand out for its originality and exclusivity. 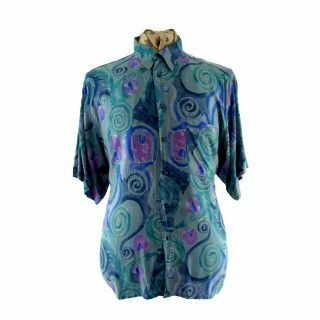 Take a look around online here and take your time to browse, there’s no rush and you’ll find that our wide selection of vintage 1990s shirts gives you ample opportunity to pick something that really stands out for you, so have a nice long look and you just know you’re going to find something you love sooner or later.